Katoomba (postcode: 2780) is the chief town of the City of Blue Mountains in New South Wales, Australia, and the administrative headquarters of Blue Mountains City Council. Katoomba is situated on the Great Western Highway 110 km (68 mi) west of Sydney and 39 km (24 mi) south-east of Lithgow. Katoomba railway station is on the Main Western line. Katoomba is a base for bush and nature walks in the surrounding Blue Mountains. At the 2016 census, Katoomba had a population of 7,964 people. Kedumba or Katta-toon-bah is an Aboriginal term for "shining falling water" or "water tumbling over hill" and takes its name from a waterfall that drops into the Jamison Valley below the Harrys Amphitheatre escarpment. Previously, the site was known as William's Chimney and Collett's Swamp. In 1874 the locality was named The Crushers after the name of the railway station that served a nearby quarry. The name Katoomba was adopted in 1877 and the town achieved municipality status in 1889. For thousands of years, the Blue Mountains have been home to Aboriginal peoples, particularly the Gundungurra and Darug tribes. They knew the area known as kedumba, meaning shiny, falling waters. Even today, there are still plenty of traditional Aboriginal peoples living in the Blue Mountains, where there are now a number of cultural sites that walk visitors through the region’s rich past and share the customs and heritage of the local tribes. Katoomba and nearby Medlow Bath were first developed as tourist destinations towards the end of the 19th century when a series of hotels were built and then repeatedly extended. Coal and shale mining was also carried out in the Jamison Valley for many years, but when the seams were completely exhausted by the early 20th century, Katoomba was an established resort town. By the 1960s, Katoomba had somewhat declined, and several of its guest houses were converted for other purposes including convalescent hospitals. Some succumbed to arson. Housing was inexpensive, allowing many young families to establish themselves, many of whom still live there. In the 1980s, the guest houses and hotels again became fashionable and many were restored to their former glory. Housing in the Katoomba region has become more expensive, but in general housing prices in the district are still markedly lower than those in the Sydney Metropolitan area. Tourism to the area has increased significantly since 2010. 63-69 Katoomba Street: Paragon Cafe, Katoomba; also listed on the (now defunct) Register of the National Estate. Uniting Church: situated in Katoomba Street, the Uniting Church—formerly the Methodist Church—has survived as an example of Gothic styles that have stretched from the Victorian era to the inter-war period. It was designed by Henry Simonson and the main building was constructed in 1888. The parsonage was built in 1906 and the church hall in 1933. Swiss Cottage (formerly known as Lurline Cottage): this Federation Queen Anne cottage was built in 1898 on the east side of Lurline Street. Incorporating parts of the original St Hilda's Church hall, it belonged to H.A. Bundy, who called it Rubyston. It had a number of owners over the years and later served as a guest house, but deteriorated somewhat until the late 1980s, when a new owner opened it as the Lurline Cottage Tea Room. It became the Swiss Cottage Restaurant in the 1990s. Since 2012 it has been Pins on Lurline. Kapsalie: this Federation Bungalow-style home was built in Lurline Street in 1915. The owner was Mrs. Fanny Allibone, who called the house Cheltenham. It changed hands in 1919, and the Varipatis family eventually acquired it in around 1940. This family ran a seafood restaurant in Katoomba, and they named the house Kapsalie after their home town in Greece. Katoomba Court House: by the 1890s, Katoomba had grown enough to need its own court house, which was designed by the Government Architect, Walter Liberty Vernon, and built in 1897. It was constructed of sandstone obtained from local quarries. By 1925, the work of the court had increased to the point where the old building was too small, so extensions were designed by Richard Wells. Further changes and extensions took place in the late 1940s and 1989. The court house is listed on the Register of the National Estate. Varuna: this house in Cascade Street was built in 1939. It was the home of Eleanor Dark and Dr Eric Dark, who moved to Cascade Street in 1923. Their new home, built in 1939, was designed by Eleanor Dark. The Darks were extremely active in the writers' community of the Blue Mountains, which flourished as a result of many writers and artists moving to the area. Varuna became central to this community in the 1940s. It became a writers' centre in 1989, under the name Varuna, The Writers' House. The house, studio and garden are all listed as being of heritage significance. Katoomba has an oceanic climate (Cfb) with mild summers and cool winters. At Katoomba (1040 metres above sea level) summer daytime temperatures are usually in the low 20s, with a few rare days extending into the 30s (Celsius). Night-time temperatures are usually in the low teens. In winter the temperature is typically about 10 °C (50 °F) in the daytime with 0 °C (32 °F) or so on clear nights and 3 to 4 °C (37 to 39 °F) on cloudy nights. There are usually two or three settled snowfalls per year. Katoomba is quite wet all year round; the annual rainfall is about 1,400 millimetres (55 in) with many misty days. Temperatures are on average 7 °C (13 °F) lower than Sydney. Katoomba has 79.8 days of clear skies, annually. The Blue Mountains has a reputation for snow in winter. However, despite the cool temperatures, there are only around five snowy days per year in the upper mountains area. It is extremely rare to see snow below Lawson. It is not unusual to see white blankets of frost covering the ground in the early morning hours. In the evening, thick coverings of ice can form on car windscreens. Several significant snowfalls have been recorded. On 5 July 1900, snowdrifts were over 6 feet (1.8 metres) deep in parts of the Blue Mountains. The snow and ice caused significant problems throughout central New South Wales, with rail and road closures, damage to buildings, and disruption to telegraph services. A winter storm on 17 July 1965 also produced very heavy snow and ice in the area, with damage to buildings and major difficulties with road and rail transport. More recently, a cold snap brought very heavy snow, up to 20 cm, to Katoomba and other towns in the upper Blue Mountains on 17 July 2015 which was the heaviest snowfall in many years. The area's scenery and art deco-style shops and houses attract an alternative subculture. Many poets, artists and environmentalists reside in Katoomba and the Blue Mountains generally, and the town hosts the Winter Solstice festival, Winter Magic, that features local talent, art and handicraft. The festival was established in 1994 to provide a local focus for the Blue Mountains-wide Yulefest. Yulefest is a long-running tourism initiative that promotes Northern Hemisphere-style Christmas celebrations during the Australian winter months June to August. Novelist and historian Eleanor Dark (1901–1985) lived in Katoomba with her husband Dr. Eric Dark from 1923 until her death. The couple's home "Varuna" is now Varuna, The Writers' House. In 1921, production house duo Raymond Longford and Lottie Lyell filmed The Blue Mountains Mystery in part around the town centre. Ursula Dubosarsky's 1991 time-travel novel Zizzy Zing is set in Katoomba in 1938, at the time of the Sesquicentenary. Poet and author, Steven Herrick wrote a novel, 'The Bogan Mondrian' located in modern-day Katoomba. His verse-novel, 'love, ghosts and nose-hair' is also set in the town. Blues musician Claude Hay is also a resident of Katoomba, having built his home and recording studio on the outskirts of town. Both of Hay's albums, 2007's Kiss the Sky and 2010s Deep Fried Satisfied were recorded in Katoomba, with the latter earning Hay critical acclaim and a #1 on the Roots Music Report Australian chart and #21 for airplay worldwide in October 2010. The scenic beauty and tranquillity of Katoomba and the surrounding Blue Mountains area have long made Katoomba a haven for Sydney-siders looking for rest and relaxation. Many celebrities and affluent locals have built or restored houses with magnificent views, especially in Leura, just to the east of Katoomba. As well as attracting a resident artistic community, Katoomba and its environs has also been the inspiration for art and music. For example, Australian artist Peter Kingston, a long-time campaigner for the preservation of Sydney's Luna Park, has produced many works inspired by Katoomba and surrounding areas including the etching "Brave and Cruel" which shows a dark figure leaving Leura Railway Station. Another example is The Mexican Spitfires song "Until" which includes lines reflective of the idea of Katoomba as a sanctuary from city life: "In distance I found strength/Katoomba gave me peace of mind." In addition to its alternative sub-culture, the area is home to a large number of culturally diverse families and has a significant Aboriginal population. Catalina Park, commonly known as the Gully, was declared an Aboriginal Place in May 2002. It is an ecological and culturally sensitive area with a long history of occupation by the Gundungarra and Darug tribes. The Gundungurra Tribal Council Aboriginal Corporation, which is based in Katoomba, is a not-for-profit organization representing the Gundungurra traditional owners, promoting heritage and culture and providing a support for Gundungurra people connecting back to Country. Gundungurra Tribal Council Aboriginal Corporation has had a registered Native Title Claim since 1995 over their traditional lands which include the Blue Mountains and surrounding areas. Katoomba is the home of local community radio station 89.1 Radio Blue Mountains. The local cinema is called The Edge, located on the Great Western Highway. Since 2014, Katoomba has hosted the biennial Vertical Film Festival. There is also a live entertainment scene in Katoomba, with a wide range of music on offer at various venues, and theatre. Aboriginal and Torres Strait Islander people made up 3.6% of the population. The most common ancestries were English 28.9%, Australian 22.6%, Irish 11.8%, Scottish 8.6% and German 4.2%. 73.0% of people were born in Australia. The next most common countries of birth were England 5.5% and New Zealand 2.0%. 84.7% of people spoke only English at home. The most common responses for religion were No Religion 44.1%, Catholic 14.4% and Anglican 12.0%. The median age was 46 years, compared to the national median of 38 years. Children aged under 15 years made up 15.5% of the population (national average is 18.7%) and people aged 65 years and over made up 19.6% of the population (national average is 15.8%). The median household weekly income was $976, compared to the national median of $1,438. 55.2% of households were family households, 38.8% were single-person households and 6.1% were group households. The average household size was 2.1 people. Katoomba's main industry is tourism based on its mountain scenery. The rock formation known as the Three Sisters, viewable from Echo Point about 2 kilometres (1.2 mi) south of the main town, attracts four million visitors each year. Other features of the Jamison Valley visible from Echo Point include Mount Solitary and the rock formation known as the Ruined Castle. A short walk from Echo Point leads to the Giant Stairway which provides access to a number of nature walks through the Valley. Several of the Jamison Valley tracks, including the Stairway itself, were closed in recent years due to maintenance, but most have since been re-opened. The local geography includes extensive areas of dense warm temperate rainforest, hanging swamps and a series of waterfalls. Other attractions include Scenic World, a tourist complex in the southwest of the town. This site is home to the steepest funicular railway in the world, the Katoomba Scenic Railway, which was originally built to facilitate coal and oil shale mining in the Jamison Valley. Scenic World also offers the Scenic Skyway cable car, which travels over an arm of the Jamison Valley and offers views of Katoomba Falls and Orphan Rock. In 2004 the original Skyway car was replaced by a new car with a liquid crystal panel floor, which becomes transparent while the car travels. In 1983 construction began at the site on a roller coaster called the Orphan Rocker; the track was completed, but this attraction has never been opened to the public. Katoomba is served by hotels and guest-houses, the oldest of which is the Carrington Hotel, established in 1882 and occupying the highest point in town. The town centre, centered on Katoomba Street, features dozens of cafes and restaurants, including the Paragon which dates to the early 20th century, as well as a number of second-hand book and antique stores. ^ a b c Australian Bureau of Statistics (27 June 2017). "2016 Community Profiles: Katoomba (SSC)". 2016 Census of Population and Housing. ^ "Mount St Marys College and Convent". New South Wales State Heritage Register. Office of Environment and Heritage. H01681. Retrieved 18 May 2018. ^ "Carrington Hotel". New South Wales State Heritage Register. Office of Environment and Heritage. H00280. Retrieved 18 May 2018. ^ "K032: Carrington Hotel". New South Wales Heritage Database. Office of Environment and Heritage. Retrieved 17 August 2012. ^ "Katoomba Post Office (former)". New South Wales State Heritage Register. Office of Environment and Heritage. H01453. Retrieved 18 May 2018. ^ "The Paragon". New South Wales State Heritage Register. Office of Environment and Heritage. H01959. Retrieved 18 May 2018. ^ Curtin, Jennie (16 February 2018). "Paragon Cafe forced to quit historic home". Blue Mountains Gazette. Retrieved 26 June 2018. ^ "K034: Paragon Cafe Group". New South Wales Heritage Database. Office of Environment and Heritage. ^ "Katoomba Railway Station and yard group". New South Wales State Heritage Register. Office of Environment and Heritage. H01174. Retrieved 18 May 2018. ^ "Lilianfels". New South Wales State Heritage Register. Office of Environment and Heritage. H00431. Retrieved 18 May 2018. ^ "K067 : Uniting Church Group". NSW Govt Office of Environment & Heritage. local council. Retrieved 17 August 2012. ^ "K139 : Swiss Cottage". NSW Govt Office of Environment & Heritage. local council. Retrieved 17 August 2012. ^ "Pins on Lurline". Pins on Lurline. Retrieved 18 May 2018. ^ "K140 : Kapsalie". NSW Govt Office of Environment & Heritage. local council. Retrieved 17 August 2012. ^ "K025 : Court House". NSW Govt Office of Environment & Heritage. local council. Retrieved 17 August 2012. ^ "K083 : Varuna House, Studio and Garden". NSW Govt Office of Environment & Heritage. local council. ^ "Climate Statistics for Australian Locations". web page. Australian Government Bureau of Meteorology. 2011. Retrieved 31 May 2011. ^ "About the Blue Mountains Weather and Climate". web page. Blue Mountains Australia. Retrieved 20 October 2018. ^ "Climate statistics for Katoomba". Australian Bureau of Meteorology. Retrieved 13 April 2013. ^ "Varuna – The Writers House". Retrieved 15 May 2008. ^ "October 8, 2010". Rootsmusicreport.com. 10 August 2012. Retrieved 17 August 2012. ^ "Katoomba". Visit NSW. Retrieved 11 May 2013. ^ "Katoomba Scenic Railway". InfoBlueMountains.net. Retrieved 11 May 2013. 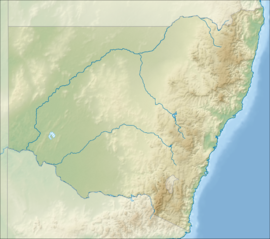 Wikimedia Commons has media related to Katoomba, New South Wales. "The making of the Giant Stairway in Katoomba". 99boomerangs. 5 December 2012. Archived from the original on 1 April 2015. This page was last edited on 21 April 2019, at 06:54 (UTC).